Grape vines do surprisingly well in pots. They’re adaptable plants and, properly maintained, require relatively little space. Likely because of the huge wine-growing industry, a massive range of varieties for both cold and temperate regions are available. If you want to grow grapes in containers, then I highly recommend you do. They’re perennial, so there’s no need to re-pot every year and yields can be high. Grapes are also a good candidate for indoor growing. If you have a greenhouse or particularly bright window, they are a good choice. Variety selection is everything! General care tips (as outlined in this article) are consistent across climates, but it’s vital you get off to a good start by picking the right kind of vine (bare-root or potted). Pruning is the other main concern. While the growth of grape vines in pots won’t be as vigorous as plants in the ground, pruning practices are essentially the same. There will just be less to do and a few slight variations. Difficulty of growing in pots? Medium - Difficult. If you can find a loam-based compost like John Innings No. 3 then use it. Add extra grit for drainage (1/3 grit for most Mediterranean plants is usually a good idea). Alternatively, any potting mix is fine. Just remember to add 1/3 grit for drainage! If you don’t intend to feed through the growing season, add a few handfuls of slow-release fertiliser. Because they’re hungry plants, it’s better to liquid feed on a weekly or bi-monthly basis. I know I bang on a lot about drainage. But with perennials that are going to be living in the same pot for years it’s even more essential. Soil structure will break down over time, so it’s important to add a long-lasting amendment like grit or composted bark. Pay attention to variety selection. With grapes, there are lots of varieties to choose from – tailor your pick accordingly. I’ve included some varieties that are great for pots below, but you should be clear about what flavour you want. There are cold-hardy varieties, varieties for wine, for eating, compact-sized and so on. Pick accordingly! Plant the vine from late autumn to late spring. The earlier the better. Give it the sunniest, most sheltered spot possible. Canes like to be supported though it’s not strictly necessary. The young vine should be trained up a central support (bamboo canes are fine) and will benefit from a little trellis support against a wall if it’s available (though this isn’t entirely necessary). Sometimes you can buy more mature plants that have already been trained. If they’re available (keep an eye on the big seed websites) then you might want to think about this. Fertilise regularly with a balanced NPK fertiliser (either weekly or bi-monthly) and a micronutrient feed like liquid seaweed. One of the real keys to success with container growing in general is to adapt your feeding schedule to the growing phases of your plants. With grapes, consider feeding with a high phosphorous fertiliser (which is responsible for bloom development) once fruit starts to appear. (This isn’t necessary and is only for those who want to provide their vines with a little extra TLC). The idea behind limiting the fruit a vine produces is that it will focus its energy into the remaining fruit. It’s important to keep the plant well-watered in the first few years after planting. Once established, the need to water in dry spells (though still required) becomes less urgent. Grapes prefer full sun so give them the best spot you can. Providing lots of light (above any other factor) is the key to good harvests. Grape vines are very attractive plants, especially when grown against a wall or fence for support. In year 3: allow three bunches of grapes to ripen. In year 4, allow five by snipping off other flowers. After this, you can experiment with more (or fewer) bunches. Mulch the top of your pots by removing the top 3-4 inches of potting mix and adding new compost (preferably) or nutrient-rich potting mix every couple of years. Pruning grape vines can seem a little tricky and there are a few different options. 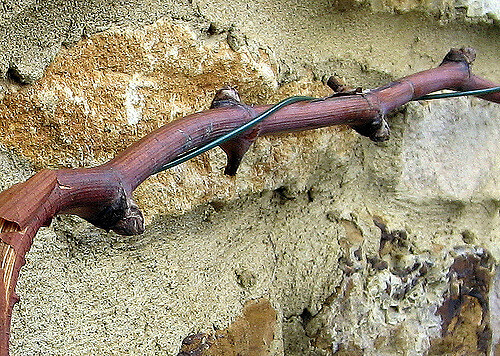 There are two widespread methods of pruning grapes: the Guyot (cane) and the cordon (spur) method. It’s difficult to verbally describe the difference between the two. Check out the excellent video below to get a clear idea (actually watch it, it’s a really good explanation). Essentially, the Guyot method involves cutting back to the top of the main trunk every year, while the cordon method involves cultivating “arms” that support numerous stems which are cut back after each season. Because pots can only sustain so much growth you want to opt for a type of cane (Guyot) pruning method called Umbrella Kniffen. This will likely result in optimum harvests. Pruning in the first few years will focus on establishing the plant. In pots you should aim to establish one main vine (1st year) that will act as the central trunk. After planting, cut back the central vine so that you have about three buds left on the main stem. 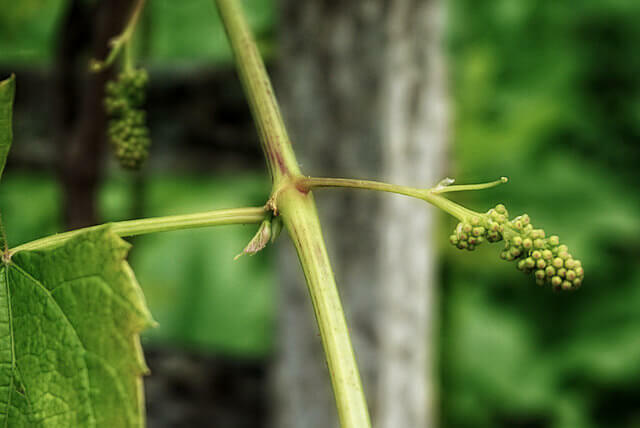 Allow the vine buds to develop to no more than 12 inches and select strongest, tying it to a central stake. Snip off the others. During the first season, your job is to let this central vine develop as much as possible while snipping off any side growth. When it gets to your desired height, simply snip off the top. It might take you another season to achieve this. The video below is a good example. After this initial pruning phase new shoots will grow from the top of the trunk. Leave these to grow but remove any that emerge lower down. At the end of the season you will have one central stem and several fruiting canes. Now you can pick two side stems (pots will struggle to support more fruit) and get rid of the rest, except for two canes which will act as renewal spurs (that will become the season after next’s fruiting canes). Cut the renewal canes down to two buds. So you’re left with two fruiting canes and two renewal spurs. Simple! One last point. In the first two years, snip of all the flowers. The idea is to encourage your new vine to put all its energy into getting well-established in its new home. Taste is the best test of ripeness! Late summer to early/mid autumn is the usual time for harvesting. Towards the end of summer, you may want to remove leaves that are shielding the grapes to allow sunlight to reach them. Wasps can be a nightmare, as can birds. The best remedy is netting but it can be a hassle to cover entire plants. Wrapping individual bunches is often the best remedy. Downy mildew, signified by white, powdery fungal growth, can often be remedied by increasing air circulation through selective pruning of leaves and shoots. Grey mould may be a sign of underwatering. The key thing to remember is to get a self-pollinating variety. The majority of grapes are self-fertile, but it’s worth checking, especially if you’re only growing one plant. Somerset Seedless – Medium-sized grapes with a strawberry-like flavour. Height (up to 70 inches) and spread are both reasonable. Hope Seedless – A green grape vine that’s particularly high-yielding. Low height but spread can be broader. Mars Seedless – A purple grape that’s on the shorter side. Good pest resistance. Boskoop Glory – A vine that is very well-suited to UK growing conditions. They’re very tasty, early cropping and have good height and spread for containers. 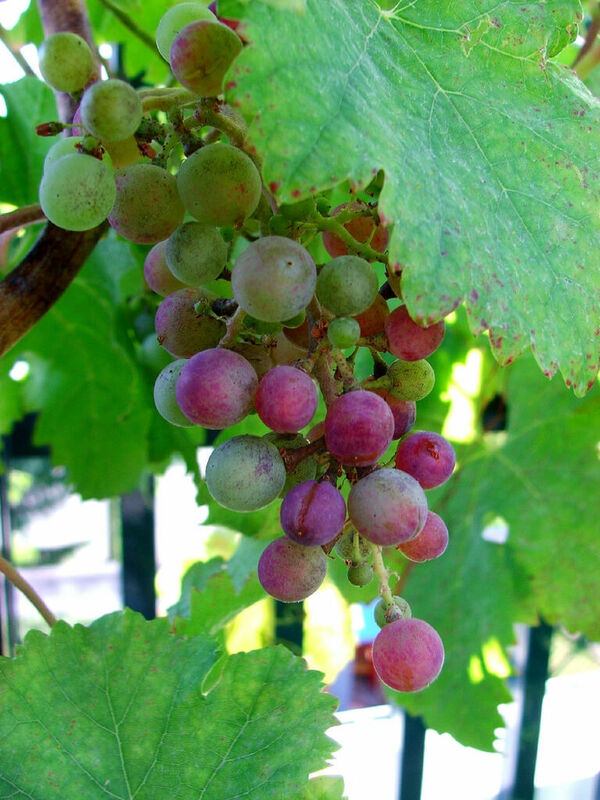 Flame – A pink grape that’s suitable for containers. It will do well in conservatories and greenhouses. Dornfelder – A German variety that grows well in the UK. Grape jam is always a great option. I prefer the recipes that use natural pectin alternatives (like lemon juice). Check out this wonderfully simple recipe. There’s so much good information about grapes on the web. Just remember that you need to adapt to pots! Have you tried growing grapes in containers? Leave a comment below and let me know how it went! Image credits: Steph L; Vercoquin; Kate Ter Haar; Mark Shirley.